My brand new puzzle book is now live on Kickstarter! This project is dependent on it reaching a certain level of funding, so do please come along and back us – and use the social media links on the Kickstarter page to share it with your friends. Thank you so much! I might as well keep it brief now, then. Here’s a puzzle for April 1st (it’s actually a normal puzzle without tricks – it just spells ‘FOOL’ in the given numbers). Place 1 to 9 in each row, column and bold-lined box. Sudoku April 1st puzzleWow, it is a long time since I posted here. So much to do, so little time! Here’s a puzzle for April 1st. It’s actually a normal puzzle without tricks – it just spells ‘FOOL’ in the given numbers. 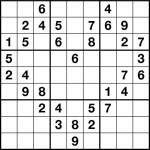 Like any Sudoku, simply place 1 to 9 in each row, column and bold-lined box. 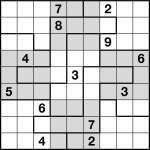 The puzzle combines regular Sudoku with Jigsaw Sudoku. Just place 1 to 9 once each into all of the nine rows, columns, 3×3 boxes (indicated by both shaded and unshaded background areas) and bold-lined jigsaw regions. 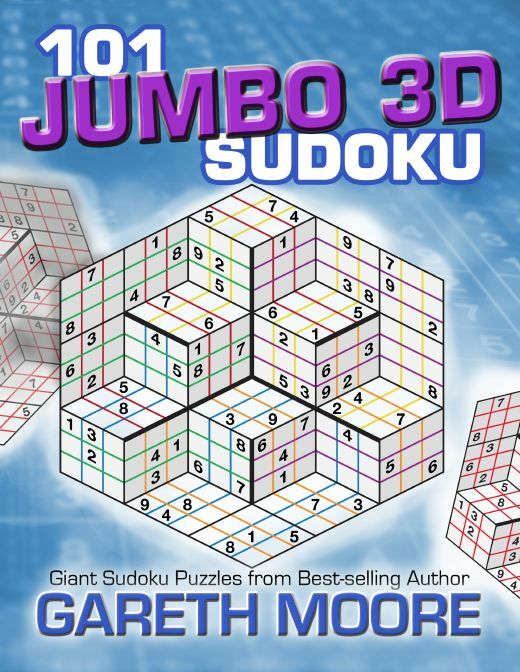 A brand new book, packed with 101 Jumbo 3D Sudoku, is now available for purchase from Amazon. You can either search for this directly, or you can click through via my PuzzleBooks.org site – the book is at the very bottom of that page, and clicking on it will take you direct to the correct page on your nearest Amazon store. If you’re not sure of the rules, or haven’t seen one of these puzzles before, then check out the example puzzle I posted last week. 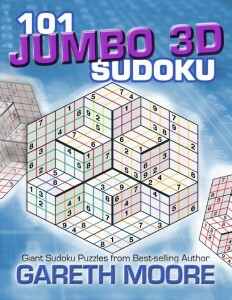 Jumbo 3D sudoku puzzleI haven’t posted for a while so I thought I should post one of my new puzzles. This one is a Jumbo 3D Sudoku, where the aim is simply to place 1 to 9 into each black-lined 3×3 area as well as each of the 54 rows indicated by the coloured lines. Thick black lines indicate borders where the rows don’t continue. 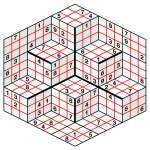 There’ve been 3D sudoku around for a while, and in terms of solving there’s little difference from regular sudoku except for the increase in size and the way in which the bendy regions can easily cause you to miss an “obvious” deduction! This is the biggest I’ve seen, but it’s perfectly possible there are larger ones I’m not aware of. 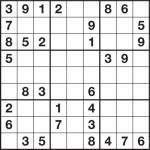 Anyway, if you’re a fan of samurai sudoku or any other kind of large sudoku then you should enjoy this, I hope! Average solving time is around 1 hour. 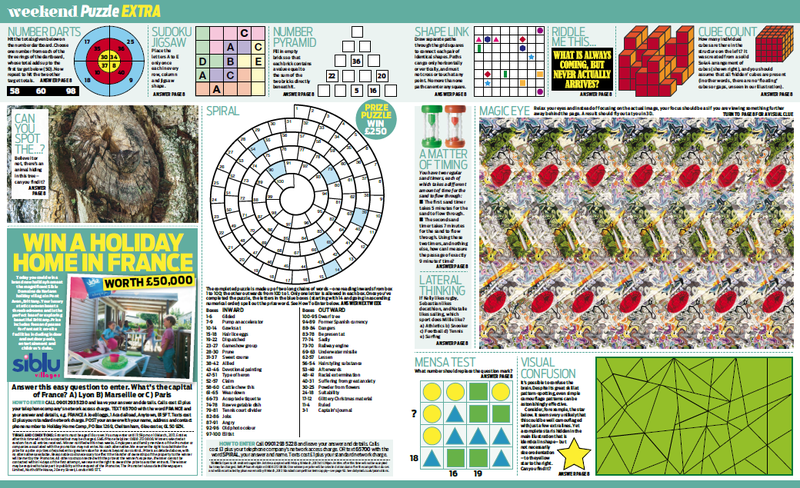 Mind you, it’s not just sudoku – there’s also the UK puzzle championship taking place the same weekend, and there’s a low price which includes overnight accommodation and most meals for those who take part. Winners of both events get the chance to represent the UK in the World Puzzle Championships and World Sudoku Championships. One of the puzzles in the sudoku part of the tournament is Product Killer Sudoku, a variant on Killer Sudoku where multiplication, rather than addition, is used. So: just place 1 to 9 once each into every row, column and bold-lined box. Also place numbers in each dash-lined cage so they multiply to the given total. You also can’t repeat a number within a dashed-line cage. 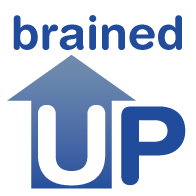 I’m incredibly excited to announce Brained Up, a cutting-edge brain training site that will help you do just that – upgrade your brain! It’s based around daily online sessions that each provide a wide-ranging mental workout. The site launched just before Christmas, and already has a healthy number of daily users. Just a few minutes a day is all it takes to upgrade your brain. Visit Brained Up and receive a personalized training plan, optimized to get the best out of your body’s most important organ. Your personal schedule will include a wide range of brain games, ensuring full coverage of key mental skills. Using Brained Up, just a few minutes a day is all it takes to upgrade your brain. The site constructs a personalized training plan for every user, optimized to get the best out of your body’s most important organ. Every schedule includes a wide range of brain games, ensuring full coverage of key mental skills – as well as keeping it fun throughout. Studies have shown that suitable brain training activity can make you quicker and smarter, which can lead to improved creative, conversational and social skills. Brained Up therefore features scientifically designed exercises, based on extensive research, to help ensure comprehensive coverage of key cognitive skills, including creativity. Sudoku and of course many more. 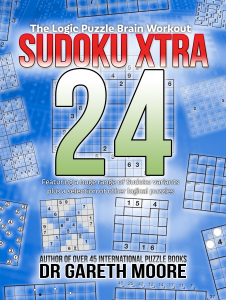 This issue I’ve included some new sudoku types such as Two-grid Interconnected Sudoku, Mystery Multiple Sudoku and Blackout Sudoku. 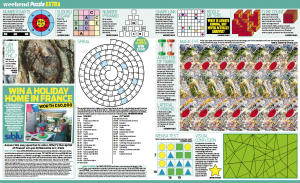 I’ve also made an effort to include all of the most popular variants as requested by readers, such as Consecutive Sudoku, Inequality Sudoku, Odd/Even Sudoku – and of course many more. 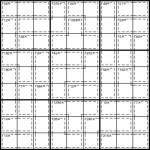 There’s also a range of non-sudoku puzzles, including Light-up/Akari, Hashi, Slitherlink, Battleships, Skyscrapers, Calcudoku, Futoshiki, No Four in a Row, and more! It’s available either as a PDF to print yourself (every page is self-contained, so you can print only the pages you want), or as a professionally-printed book direct from Amazon – there are links for all of these on the Sudoku Xtra site.